Most of you are familiar with Bitcoin, but the family of cryptocurrencies extends a lot further than that. You may also have heard about, Litecoin and Ether. Another cryptocurrency causing ripple effects throughout the digital currency market is... Ripple. Although Ripple has its own currency, its value is perhaps most noticeable due to its ultra quick payment system. This article reviews Ripple in detail and explains the key aspects of the cryptocurrency in question. You will find out how Ripple works and what the main differences between Ripple and Bitcoin are. Before we dive into that, let's start with the most basic question: What is Ripple? Ripple is considered to be a venture startup from San Francisco. It has engineered a payment system similar to Blockchain. It's a payment protocol that functions similarly to a payment system, remittance network, and currency exchange. It works with cryptocurrencies, fiat currencies, and commodities. Ripple allows clients to integrate the protocol into their own systems. The National Bank of Abu Dhabi has recently started to use the technology for some of its transactions, specifically for cross-border transactions. It allows its customers to transfer funds in real time. Ripple uses a similar blockchain as Bitcoin, except that the Ripple's cryptocurrency is called "Ripples". In terms of market capitalisation, Ripple is the third largest cryptocurrency – after Bitcoin and Ether. What's the Abbreviation for Ripple? The shortcut for Ripple is simply XRP. Ripple can also be paired to other currencies, just like with USD (US Dollar) and EUR (Euro). The Ripples vs the US Dollar currency pair name is, therefore, XRP/USD. What's the Difference Between Ripple and Bitcoin? Ripple is considered Bitcoin's competitor and there are certain advantages to it. Ripple doesn't depend on a single company for securing and managing its transaction database. Thus, there is no waiting for block confirmations. According to Market Mogul 1, there's a difference between the time to settle Bitcoin and Ripple. The time to settle Bitcoin has increased, reaching 168 minutes on March 27, whereas Ripple took an average of 3.7 seconds. The money transfers between Spain and Mexico were undertaken by the BBVA, and it was found out that Ripple needed only seconds, whereas a standard transfer would take four days to clear. Ripple offers faster settlement time: As explained above. Ripple uses an iterative consensus process: Bitcoin uses the so-called mining. Currency vs Transaction network: Bitcoin is a decentralised digital currency, whereas Ripple is basically a transaction network that also contains a digital currency – Ripples. No, Ripple cannot be mined. Ripple started with a fixed numbers of Ripples (XRP) and has no expansion built into it, according the to the Ripple protocol rules. Therefore, no mining of new coins is needed. The total number of XRP created is 100 billion, but the flow of the XRP is controlled by Ripple. This has received criticism from Bitcoin sympathisers who praise Bitcoin from any centralised control over its creation or distribution. Ripple responded by announcing its intention to freeze 88% of its XRP assets, but sell one billion XRP every month. Both the freeze and the steady flow will allow traders and investors to count on a certain level of predictability with regard to the supply. How Does Ripple Really Work? Ripple emphasises their role in the 'global settlement network', which simply allows financial parties, such as banks, to lower their transaction costs. At the same time, Ripple also offers an enhanced service with direct and instant transactions. The image below shows how Ripple enables payments to cross the globe. Interoperable: Capability to connect multiple networks with one another. The Ripple network basically allows payments to be completed quicker – almost instantly – cheaper, more securely, and with direct access. 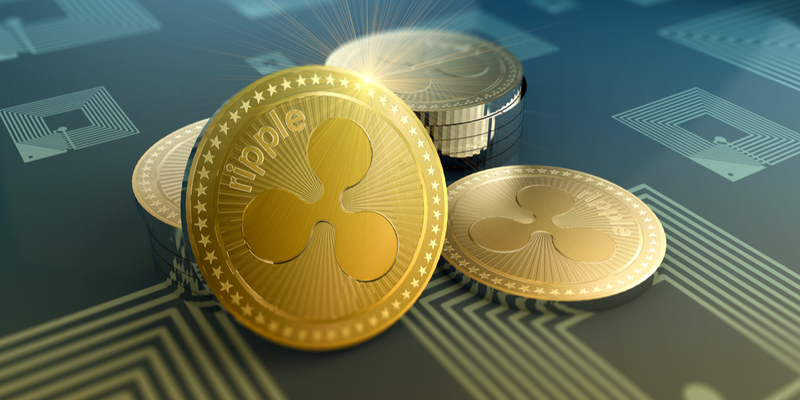 It's not surprising, therefore, that Ripple is being increasingly utilised by the banking sector, which hasn't capitalised as much on new technology as some other industry sectors. Does Ripple Use Blockchain Technology? The Ripple currency XRP helps facilitate transactions between two parties, in case no direct exchange is possible. XRP has no counterparty risk as it doesn't rely on a third party. It's thought that Ripple was founded by Ryan Fugger, but has seen a great deal of development since its initial creation. The growth of Ripple began in 2004, when the creation of RipplePay was established by Ryan Fugger. In 2011, the system was re-designed, making it faster and much more energy-efficient than Bitcoin. In 2012, OpenCoin, Inc. was formed. Since 2012, Ripple has been also focused on expanding into the banking market. What does Ripple's Future Look Like? 60 institutions around the world, including such famous firms as UBS, RBC, UniCredit, and Santander. 40% of Japanese banks will be connected to Ripple. RBS and BAML will use Ripple for both retail and commercial payment services in 2018. The National Bank of Abu Dhabi uses Ripple for international transactions (as mentioned earlier). Of course, Ripple is not as popular as its famous counterpart Bitcoin. However, with the rising interest in cryptocurrencies in general, plus Ripple's extraordinary quick network and ability to offer payment solutions, it seems that Ripple will be a hot contender for market leader over the coming years. Below, you can see the volume division for XRP. What is Ripple Backed by? Ripple operates independently of any central bank in a similar fashion to other cryptocurrencies, such as Bitcoin, Ether and Litecoin. This is a major difference as compared to such well-known currencies as the US Dollar and the Euro. These currencies are circulated and printed in the US and the EU by the respective central banks. Ripple decides the flow of XRP, which is set at one billion XRP every month 9. However, contrary to the "fiat currencies", like USD and EUR, Ripple has a maximum supply of 100 billion XRP, which are available according to the Ripple protocol. What Are the Risks of Trading Ripple? As with any financial asset, there is a risk that the price will move up and down. Ripple is subject to market fluctuations, such as demand and supply. The price fluctuation, however, is what allows traders to trade. Considering the wide acceptance of Ripple as a financial network by major financial firms and banks, it seems unlikely that any major disruptions will take place in the intermediate future. Last but not least, each Ripple account is required to have a small reserve of 20 XRP with a transaction fee of 0.00001 XRP for each trade. These actions are implemented to combat hackers who want to overload the network. But, all in all, these costs are effectively very low. The answer is yes. Regulations will vary on a country-by-country basis, but you can expect to see national financial regulators interested in Ripple and other virtual currencies, potentially along with regional regulators at a sub-country level. Additionally, Ripple has re-focussed on XRP markets, and Japan has already voted a law normalising and regulating such digital currencies as BTC and XRP 10. Is Ripple Safe to Trade? Yes, it is just as safe to trade as Bitcoin, Ether, Litecoin or any other commodity, for that matter. We suggest trading the XRP vs USD pair. Here's the chart that shows money flow into Ripple, trading volume by exchange, and total volume over time. Stay tuned for more exciting information and analysis on Ripple... But why wait? You know it's now possible to trade Litecoin on an Admiral Markets Demo account. Give it a go today… Practise makes perfect!